Higher biodiesel mandates are gaining support in Indonesia and Malaysia. Both countries seek to increase domestic consumption and mitigate the impact from unfavourable trade and non-trade barriers on palm oil, and are expected to absorb a total biodiesel consumption of 8.7m tonnes in 2019 (+35% y-o-y). The additional domestic demand comes in time to mitigate the impact if the EU reduces usage of palm oil-based biofuel (2018: 3.80m tonnes). Going all out to push for higher palm oil-based biodiesel blending. Indonesia and Malaysia are working to boost domestic biodiesel consumption, which will help offset potential demand losses from the EU. Indonesia is expected to overtake the US as the world’s largest producer and consumer of biodiesel in 2019 with an expected production of 7.3m tonnes (+37.2% y-o-y), with crude palm oil (CPO) consumption of about 1.3m tonnes. Malaysia is expected to consume about 760,000 tonnes of CPO for producing 1.4m tonnes of biodiesel in 2019 (2018: 1.14m tonnes). Potential increases in biodiesel mandates. There is room for Indonesia’s biodiesel consumption to increase further by another 3m tonnes, if the government lifts the biodiesel blending mandate from 20% (B20) to 30% (B30). Indonesia is targeting to increase the mandate to B30 by 2020 or possibly earlier. As for the Malaysian government, it targets to raise the 10% biodiesel blending mandate to 20% by 2020. The extension of the B20 mandate to industrial use in Indonesia effective 1 Sep 18 and B10 mandate in Malaysia effective 1 Feb 19 show both governments’ strong commitment to increasing domestic consumption and reducing inventory. Biofuel usage in EU could drop due to new criteria for use of palm oil in biofuel. The European Commission on 13 Mar 19 spelled out the types of palm oil-based biofuel that may be counted towards the EU’s renewable-energy goals and would be introducing a new certification system. Under the new system, usage of palm oil in biofuel might be affected, given that the EU’s palm oil-based biodiesel production stood at 3.80m tonnes in 2018 (27% of the world’s total palm oil-based biodiesel production). Biodiesel production in the EU increased from 13.55m tonnes in 2017 to 13.60m tonnes in 2018, with market share dropping from 38% of global production to 33%. For 2019, Oil World forecasted that biodiesel production in the EU might increase to 13.8m tonnes. However, its market share would drop further to 31% for 2019 with higher biodiesel demand coming from Indonesia. CPO prices were still weak in 1Q19 as palm oil inventory failed to drop as per market expectation. The unusually high production in 1Q19 in Malaysia and Indonesia capped prices. In addition, news on the EU biofuel restriction did not help to improve market sentiment. We maintain our view that CPO prices will see a better recovery in 2H19 on lower production and strong biodiesel demand, and maintain average CPO price assumption at RM2,350/tonne (US$587.50/tonne) for 2019. We upgrade IJM Plantations to BUY from HOLD with unchanged target price of RM1.80; share price has retraced from the previous high of RM1.82 in Feb 19. According to Oil World Report, global palm oil consumption is forecasted to increase 8.6% to 74.5m tonnes in 2019. Half of the 8.6% rise is expected to come from Indonesia which has higher biodiesel demand where domestic consumption is expected to increase from 10.9m tonnes to 13.8m tonnes (+26.4% y-o-y) in 2019. With the full implementation of B20 for both the public service obligation (PSO) and non-PSO segments in Indonesia, biodiesel consumption in Indonesia is estimated at 7.3m tonnes in 2019, up almost 37% y-o-y (2018: 5.3m tonnes). Malaysia’s biodiesel production is also expected to increase 23% to 1.4m tonnes in 2019 (2018: 1.14m tonnes). Growing demand for palm oil-based biodiesel. World production of biodiesel came up to 40.7 m tonnes in 2018 and is expected to increase another 9% to 44.4m tonnes in 2019. Demand for palm oil-based biodiesel is growing with market share of palm oil-based biodiesel rising 4ppt y-o-y to 35% of global biodiesel production in 2018. On the other hand, soybean oil-based biodiesel’s market share fell y-o-y from 27.3% to 26.0% last year. Palm oil gaining dominance as feedstock of biodiesel production. Global palm oil use for biodiesel increased 3.3m tonnes (+29.7% y-o-y) in 2018 and is expected to increase at least another 2.5m-3.0m tonnes (+18.4% y-o-y) in 2019. Biodiesel constituted about 21.5% of total palm oil consumption in 2018 vs 17.8% in 2017. Palm oil use for biodiesel was more dominant in 2018 due to the sharp price declines of major vegetable oils which left vegetable oil cheaper than crude mineral oil. In addition, biodiesel usage is also promoted in producing countries via favourable policies that aim to increase domestic consumption and prop up sluggish prices in 2018. For 2019, the increment in global biodiesel demand will be largely driven by higher usage in Indonesia. Biodiesel blending programme still financially viable. Global gasoil prices stood at US$606/tonne while CPO prices averaged US$453/tonne on 15 Mar 19, bringing the CPO- gasoil price differential to US$154/tonne currently. Gasoil prices have increased about 19% since 1 Jan 19, whereas CPO prices have dropped 4% over the same period. This has made the biodiesel biodiesel programme more financially viable as minimal subsidy is required. Total biodiesel production in the EU increased 0.4% to 13.60m tonnes for 2018 (2017: 13.55m tonnes). The main feedstock used for producing biodiesel in the EU last year was rapeseed oil, which accounted for about 44% of biodiesel production, followed by palm oil with 29%, or 3.80m tonnes. Brazil’s biodiesel blending mandate expansion. Brazil consumed about 4.68m tonnes of biodiesel (12% of global biodiesel consumption) in 2018. The country has increased its biodiesel blending mandate from B7 to B10. The government will start a new mandatory biodiesel blending policy to increase the mandate by 1ppt p.a. to B15. However, the B11 mandate, which was targeted to be rolled out in Mar 19, has been postponed. The feedstock of biodiesel production in Brazil was mainly soy oil with 3.45m tonnes used in 2018 (2017: 2.86m tonnes). With the higher biodiesel blending mandate, Oil World estimates biodiesel production in Brazil at 5.10m tonnes for 2019. Potential increase in biodiesel demand from Indonesia and Malaysia. Indonesia has shown a strong commitment to increasing its domestic biodiesel blending mandate. Implementation of its biodiesel mandate is smoother than market expectation, especially the extension of B20 for the non-PSO segment. The Indonesian government might bring forward implementation of the B30 mandate to 2H19 vs the initial target of early-20 pending the road test on B30 usage. Furthermore, the government has given state-owned electricity company PLN two years to fuel all diesel power plants in the country with palm-oil-based biodiesel. The Malaysian government is also looking to implement the B20 mandate for the transportation sector by 2020, thus we can expect 1.3m tonnes of CPO to be required p.a. Lower biodiesel exports from Indonesia and Malaysia. With the B10 mandate effective from Feb 19 in Malaysia, biodiesel exports dropped 16.5% to 36,986 tonnes in Feb 19 from 44,287 tonnes in Jan 19. Biodiesel export growth is expected to slow down for Indonesia and Malaysia due to their biodiesel mandate policies. Demand for CPO in Indonesia supported by biodiesel blending programme. Despite the skepticism and hiccups in the early stage of the implementation of the biodiesel blending mandate in 2015, Indonesia’s biodiesel consumption has surged from less than 1m tonnes in 2010 and is expected to hit 7.3m tonnes in 2019 (9-year CAGR of 27%). Better logistics leading to more timely shipments in Indonesia. In 3Q18, Indonesia experienced logistic bottlenecks as shipments slowed down during the high production period mainly because the biodiesel delivery ports were too scattered. The shipping congestion started to ease in early-Dec 18 when the government reduced the number of biodiesel delivery ports from 112 to 10. Fatty acid methyl esters (FAME) storage also increased 10 times in capacity to 314,000 kilolitres (kl). Indonesia’s biodiesel allocations continue to rise. For 2018, total biodiesel allocations for the PSO and non-PSO segments came in at 4.8m kl and 0.6m kl respectively. The biodiesel allocation for the PSO segment for 2019 is 5.3m kl (4.4m tonnes), up 10% y-o-y, which is within market expectations with the full-year B20 implementation. The biodiesel allocation for the non-PSO segment has yet to be announced. Indonesia’s biodiesel fund more than enough for biodiesel mandate. No biodiesel subsidy is needed at this moment as biodiesel prices are lower than diesel prices. Thus, there should be sufficient funds in the Indonesian Oil Palm Plantation Fund (CPO Fund) to support the biodiesel mandate despite the US$0 CPO export levy implemented since Dec 18 which will be valid till May 19. From Jun 19, the export levy will be calculated based on the formula announced in Dec 18. The US$1.44b (Rp20.9t) in the CPO Fund as of end-18 is sufficient to support biodiesel uptake forecasted at 6.2m kl in 2019 with a subsidy of US$1.28b needed in 2019 (assuming biodiesel and diesel fuel spread at Rp3,000/litre), according to Mr Arif, founder and executive chairman of Triputra Agro Persada Group. B30 to be Indonesia’s next target. The Indonesian government extended the 20% biodiesel blending mandate to both the PSO and non-PSO segments effective from 1 Sep 18. As a result, Indonesia’s biodiesel production came in higher than expected at 5.32m tonnes in 2018, up 2.4m tonnes or 82% y-o-y. With full-year implementation of B20 for both the PSO and non-PSO segments in 2019, total biodiesel production is expected to total 7.3m tonnes, with CPO consumption totalling 1.5m tonnes for use in biodiesel domestically. Malaysia is catching up slowly. With Malaysia’s B10 mandate for the transport sector effective from Feb 19 and B7 mandate for the industrial sector to be effective from Jul 19, total biodiesel consumption is expected to come in at 1.4m tonnes (2018: 1.14m tonnes). With this, an estimated 761,000 tonnes of palm oil would be consumed p.a. Malaysia’s CPO consumption potentially small but good enough to clear some inventory. Malaysia’s B5 mandate was launched in phases and has been in place since 2011. Nationwide adoption was completed in Jul 14. The Malaysian government has increased the biodiesel blending mandate from B5 to the current B7 for the industrial sector and B10 for the transportation sector over the past eight years. National biodiesel production has grown at a CAGR of 27% over the past eight years to 1.14m tonnes, accounting for about 3% of global biodiesel consumption. Having said that, the 509,582 tonnes of CPO used for biodiesel production in Malaysia make up about 16% of Malaysia’s total CPO consumption. Jun 11–Nov 11: Implementation of B5 biodiesel in the Central Region. Jul 13: Implementation of B5 biodiesel in Southern Region. Oct 13: Implementation of B5 biodiesel in Northern Region. Jan 14: Implementation of B5 biodiesel in Eastern Region. Jul 14: Implementation of B5 biodiesel nationwide. Nov 14: Biodiesel mandate raised to B7. Nov 18: Announcement of B7 for industrial sector and B10 for transportation sector during Budget Malaysia 2019. Dec 18: Roll-out of B10 biodiesel for transportation sector. Feb 19: Mandatory B10 biodiesel blending mandate for transportation sector. Feb 19: Target to raise B20 from B10 for transportation sector, B10 from B7 for industrial sector – Teresa Kok. Jul 19: Mandatory B7 biodiesel blending mandate for industrial sector. CPO prices were still weak in 1Q19 as palm oil inventory failed to shrink as per market expectation. The unusually high production in 1Q19 in both Malaysia and Indonesia capped prices. In addition, news on the EU biofuel restriction did not help to improve market sentiment. We maintain our view that CPO prices will see a better recovery in 2H19 with lower production and strong biodiesel demand. Maintain average CPO price assumptions at RM2,350/tonne (US$587.50/tonne) for 2019 and RM2,500/tonne (US$625/tonne) for 2020. CPO price recovery to date slower than expected. The high palm oil inventory in Malaysia and negative newsflow from the EU were the two major bearish factors capping CPO prices at RM2,000/tonne. For 1Q19, average CPO spot price came up to RM2,014/tonne, slightly above RM2,000. With the slowdown in production and festive demand kicking in, there would be more significant drawdowns in inventory in 2Q19 vs the earlier expectation of Feb 19. CPO prices should then start to inch up. Our BUYs are mainly small-and mid-cap upstream companies. 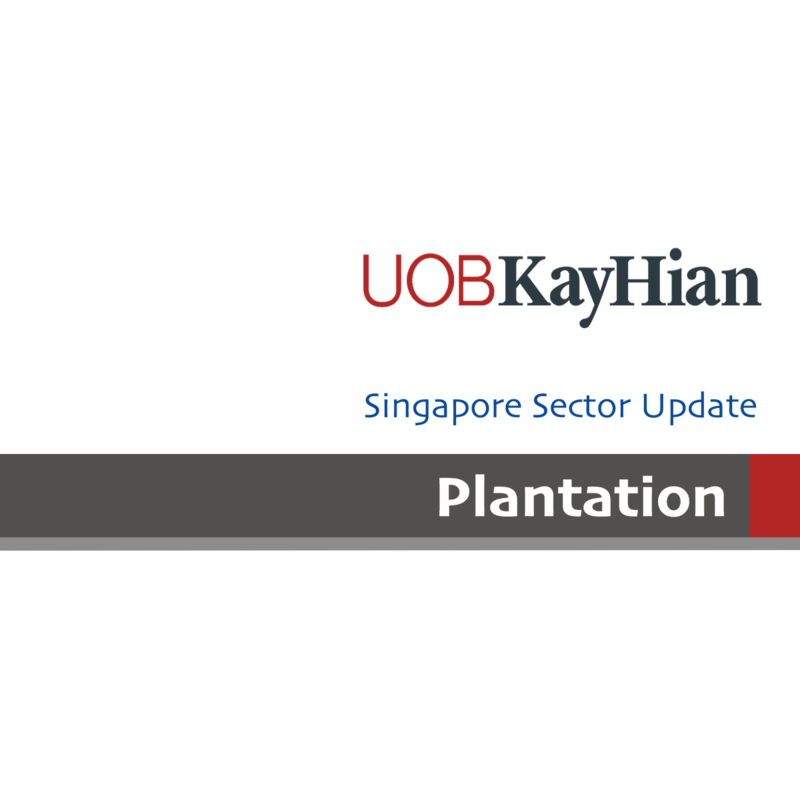 We upgrade our call for IJM Plantations (IJMP MK) to BUY from HOLD with an unchanged target price of RM1.80; share price has retraced based on 19x FY21F PE. We remain BUY on BUMITAMA AGRI LTD. (SGX:P8Z) and Tunas Baru Lampung (TBLA IJ) as their higher exposure to CPO will translate into higher leverage on CPO prices. We also have a BUY call on WILMAR INTERNATIONAL LIMITED (SGX:F34) as it continues to record strong margins at its palm refining division and expand margins at its consumer product division. In addition, the IPO for its China operations, which is slated for 3Q-4Q19, will be a key share price catalyst as the IPO proceeds are likely to be distributed as special dividends.